The Euro attempted to close above 1.14 for the 4th time in a row on Friday, however EU's weak economic data continues to indicate a slowing economic growth. The Markit Manufacturing PMI came slightly better than expected for the EU 49.3 vs 49.2, but slipped into contraction territory for the first time since June 2013. German’s index resulted at 49.3 confirming the economic downturn. Also, EU's CPI surged as expected to 1.5% YoY, although the core reading decreased to 1.0%. US data was not much better, as the Markit Manufacturing PMI was revised lower in February to 53.0, while the Michigan Consumer Sentiment Index came in at 93.8. Nevertheless, traders dismissed the data and kept bidding the US Dollar higher. Looking ahead as the new week kicks off, sentiment will most likely be impacted by a report from the Wall Street Journal over the weekend. The newspaper said China is offering to lower tariffs on US products which would remove US tarifs on Chinese imports. A light economic events calendar today has eurozone producer prices at 1000 GMT. 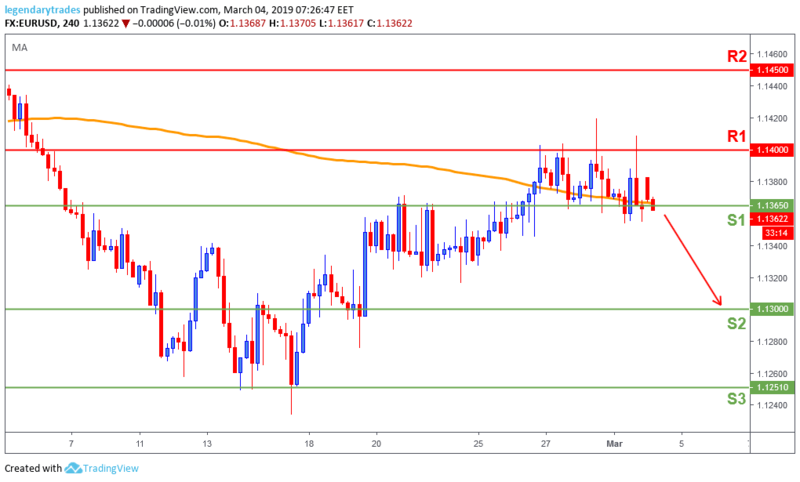 The Euro got rejected at 1.14 for the fourth day in a row, and reversed back to the 1.1365 (S1) support and the 200-day moving average (Orange line). If the bears successfully break below 1.1365 (S1), it will likely further weaken the Single Currency towards 1.13 (S2) support. However, the bulls need a break above 1.14 to continue this recent bullish trend.